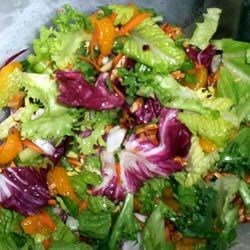 "This is a light and flavorful green salad that combines oranges and almonds." Took this to a potluck and had one person who really liked it. Everyone else felt it was just okay, including me. Wonderful fresh salad for summer!! Loved the dressing. I used baby spinach instead of romaine, it was still wonderful!